You may recall the "floridacoaster" eBay auctions for dirt-cheap "Dhofar 025 " lunar specimens? Some members acquired pieces of this alledged lunar material, and a few months ago the question arose if this is actually the real McCoy or some fake material. In the meantime, I have been suplied with representative samples of the 'floridacoaster' stuff by two IMCA members. Both provided me with their respective samples, and with the accompanying paperwork, certificates, and correspondence. The results of my study (just confirmed by Dr. Juergen Otto, a seasoned meteoriticist, and petrologist) show that the samples sold by 'floridacoaster' are terrestrial pyroclastites (volcanic rocks), or to be more specific, pieces of an ignimbrite (a brecciated type of volcanic tuff with clasts of vesicular pumice-stone). Comparisons with pieces of the real Dhofar 025 show just a superficial resemblance that is more or less confined to the color of the samples. A close inspection shows that they are very different, and that they haven't much in common. Most of our members who bought this stuff were certainly fooled because they had no real Dhofar 025 to compare with. The worst part of this whole story is that there is much evidence for the fact that this wasn't an innocent mistake by 'floridacoaster' but a deliberate act of fraud. One of the tuff samples has an artificial fusion crust, obviously created by using a welding torch on the stone. (Interestingly, Dhofar 025 is known for its very long terrestrial residence time, and for the total absence of fusion crust, something that should have been a warning sign for the more educated buyers.) Adding to that, the sample was also accompanied by a forged document (a COA for another unrelated lunaite from Dhofar, originally signed in 2003 by Prof. Bischoff, Institut fuer Planetologie, Germany). The fake document provided by 'floridacoaster' was a 1:1 copy (though on a American paper format, and not on the original European DIN A4 format) - with a forged date (dated back to 2000! ), and fake phone and Fax numbers that would leed the inquiring buyer nowhere. There are other indications that this has been a delibarate, and systematic fraud, and thanks to 'floridacoaster' we now have more than one dozen fake lunar samples in the hand of collectors, and on the market. A former member used his multiple wins from 'floridacoaster' as giveaways (after he had been warned that this might not be the real thing), and other samples were sold or traded. Please be watchful for these samples. The fake "Dho 025" must be taken out of circulation, and the buyers/owners must be informed. If you are one of the buyers, you will certainly try to get your money back from 'floridacoaster', and you might also be interested in advising eBay and the Florida Attorney General's office of this fraud. It will be my pleasure to answer further questions. 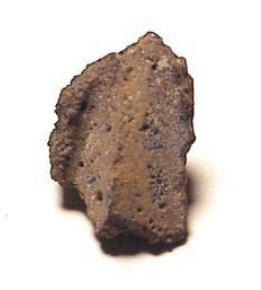 Fake "lunar meteorite Dho 025"